Defense Secretary Jim Mattis, left, and Joint Chiefs Chairman Gen. Joseph Dunford participate in a news conference at the Pentagon, May 19, 2017. Speaking to reporters at the Pentagon on Friday, Mattis declined to say whether the missile North Korea launched earlier this week had a controlled re-entry into the atmosphere. Gaining the ability to control a missile's re-entry into Earth's atmosphere from space would be a big step forward for the North Korean missile program. North Korea has made no secret of its desire to develop missiles capable of targeting some of its neighbors and intercontinental ballistic missiles capable of delivering a nuclear warhead to the U.S. mainland. South Korea's capital, Seoul, is home to about 10 million people and is located just 55 kilometers from the North Korean border. 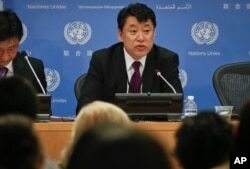 North Korea Deputy United Nations Ambassador Kim In Ryong speaks during a news briefing, April 17, 2017, at U.N. headquarters. Meanwhile, at the United Nations, North Korea's Deputy U.N. Ambassador Kim In Ryong again blamed the United States for the current tension on the Korean Peninsula. America's top general confirmed Friday that the U.S. did recently test ICBMs in accordance with international protocols, but said the test “had nothing to do with North Korea” and was a routine action to ensure a “safe, reliable deterrent” against nuclear attacks.